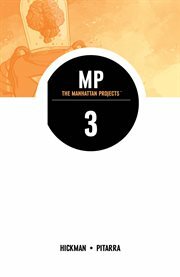 The item The Manhattan Projects, Volume 3, issue 11-15, writer, Jonathan Hickman ; artist, Nick Pitarra, (ebook) represents a specific, individual, material embodiment of a distinct intellectual or artistic creation found in Charlotte Mecklenburg Library. What if the research and development department created to produce the first atomic bomb was a front for a series of other, more unusual, programs? The acclaimed FEEL GOOD, BAD SCIENCE epic series now in one super educational package. It's The Manhattan Projects, Volume 3: Building!